Talend is a software vendor specializing in Big Data Integration. The company provides big data, Cloud, data integration, data management, Master Data Management, data quality, data preparation and enterprise application integration software and services. It is one of the best open source tools for data integration and migration. Easy interface and placement of components. Code creation by drag and drop. Export JARs, WARs and run them separately. Easy to schedule using windows Task Scheduler. How to use Talend for Data Migration in Salesforce? Launch Talend ETL in your Operating system (Window etc.). Right click on Job Designs which is on Left side of the Talend window > create job. New job pop-up will appear where you have to give a name whatever you want > Finish. Click on drop down arrow of Metadata > Choose Salesforce > Create Salesforce Connection > write a connection name as you want > Next > give credentials for valid Salesforce Org > check login > Finish. Select a Salesforce Object (In our example it is Account object). From palette side bar (which is showing in right side) select tMap. 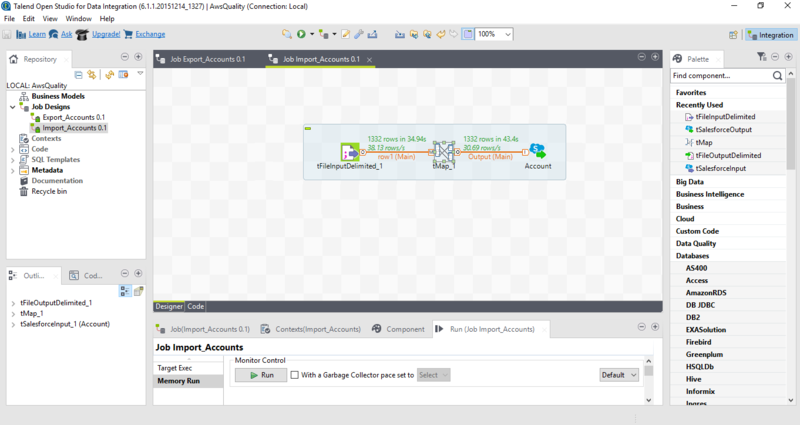 Drag and drop a connection in between Account, tMap and tFileOutputDelimited. Now double click on the tMap and do field mapping. Run the job, it successfully exported the data into CSV file. Again need to launch Talend ETL in your Operating system (Window etc.). 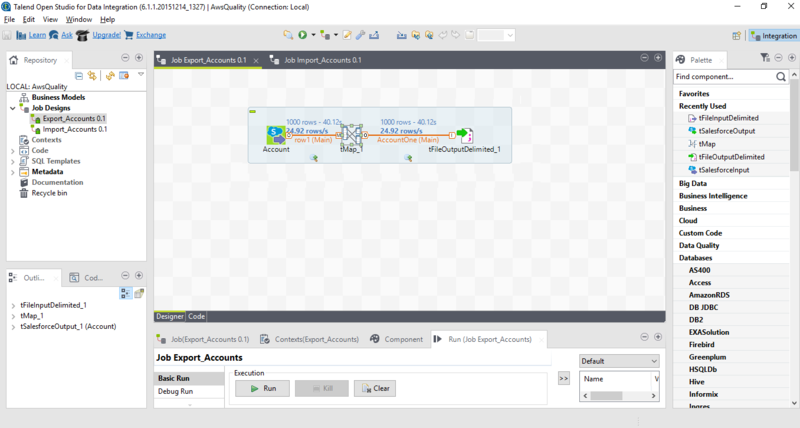 Drag and drop a connection in between tFileOutputDelimited, tMap and Account. Run the job, it successfully imported data into Account object. of the Salesforce. Above are the few steps to create a simple Jobs to migrate Account from CSV and vice versa, this is all about “Salesforce Integration and Migration using Talend ETL“.